Vacation rental house. 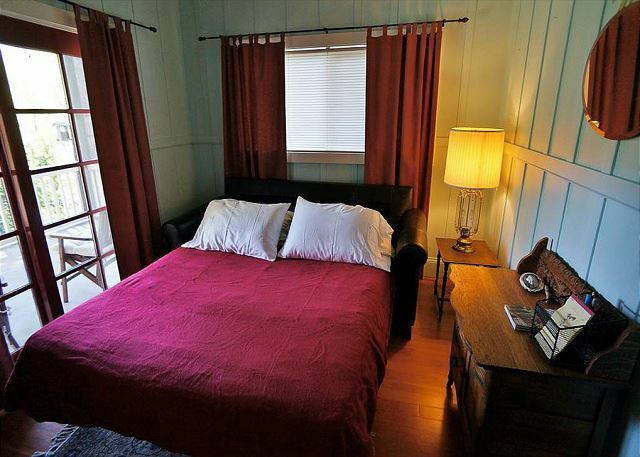 Sleeps 6, 2.5 bedrooms, 2 bathrooms. No pets allowed. This is a drone shot taken from over the river of the home. A few steps down to the top floor of this stunning, river side home will bring you to the front door of your vacation getaway! 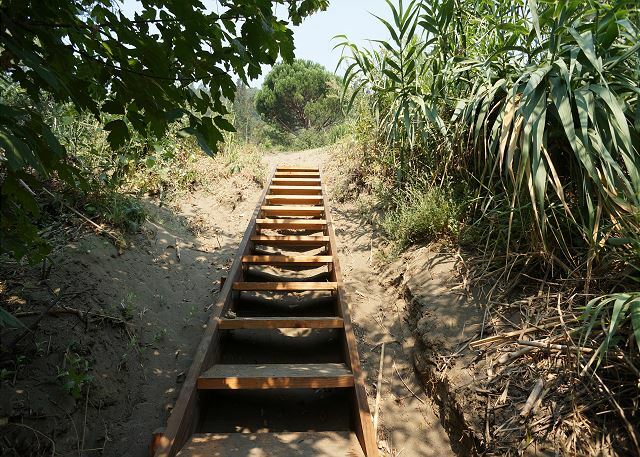 Down past the delightful garden, sitting area and spa, you will find the stairs that lead right to the water. Beautifully located, perched just above the Russian River, on S. Fitch Mountain, this vintage 1927 river home has been beautifully renovated and modernized with central heat/AC, new dual-paned windows, high open-beamed ceilings, and all the modern conveniences while still maintaining its vintage charm and craftsmanship. Convenient private off-street parking is provided for 2 vehicles. 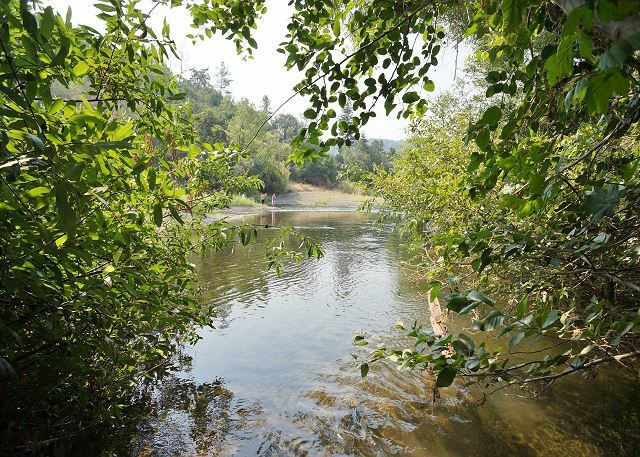 There is seasonal access to the river from the property, and the community Del Rio Woods river access area with picnic tables is just a 5-minute walk away. You can also access the outdoor river porch through a double full paned slider, again with forever views of Mother Nature and Old Man River, arm in arm. Also enjoy the small work desk with WiFi modem; another full-paned, double slider provides access for the river porch entertainment area and more views! 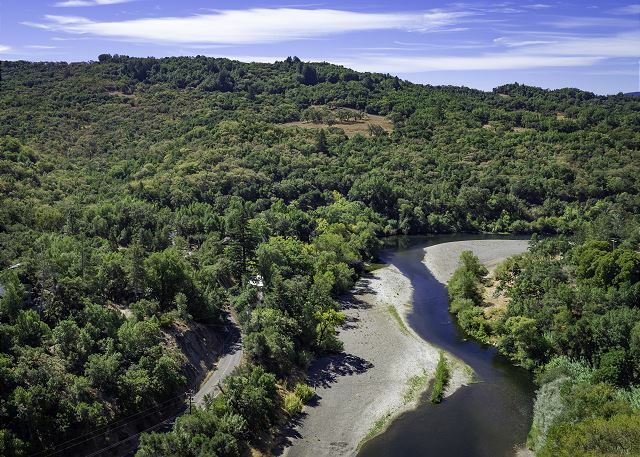 At the confluence of the Russian River, Dry Creek and Alexander Valley wine growing regions, Healdsburg is a world-class destination featuring outstanding wine tasting, fine dining, art and antique galleries, specialty shops and spas. Visitors can enjoy a wide variety of activities centered around the mature redwood tree-lined, newly renovated, central plaza with fountain and gazebo. The surrounding areas are also rich in opportunities for hiking, biking, golfing, fishing, canoeing, kayaking, and exploring the beautiful Northern California coastline and Redwood forests. 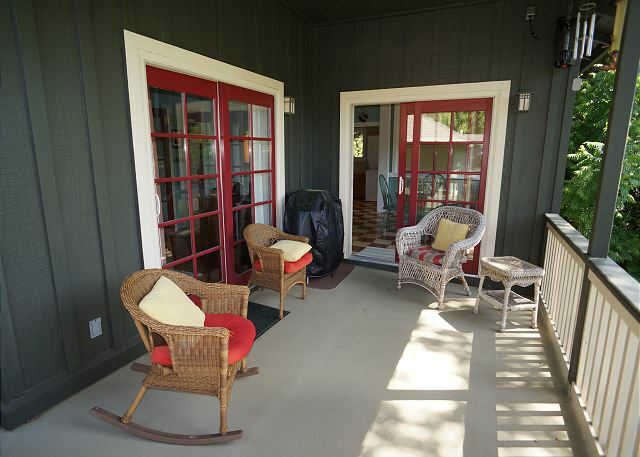 We have been coming to Healdsburg for many years and this is the first time we rented a home. The location was perfect for getting to all of our favorite wineries. The home was very charming with plenty of space and a beautiful view. We would definitely stay here again! House is even better than the photos! A group of 5 girls, great space, no one had to share a bed. We cooked all meals in the kitchen, with no issues. Had coffee and wine on the porch, and enjoyed the hot tub. 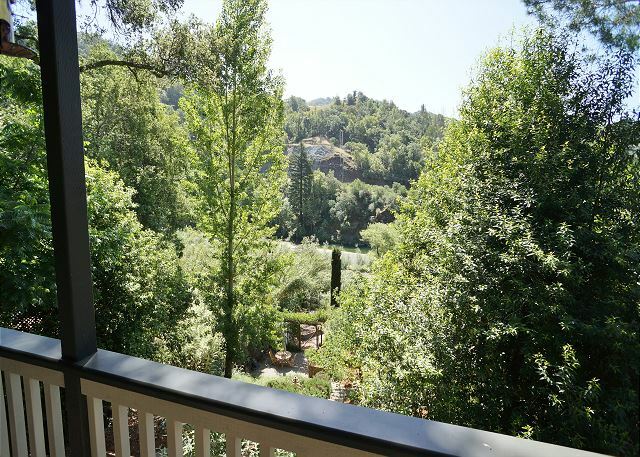 Only 5 minutes from Healdsburg, but you also feel like you are in the forest! We are so happy you enjoyed your stay in this delightful home! We home you get the chance to come stay again! I stayed in Healdsburg for a Winery Legacy Dinner. Loved the house and it's vintage feel. It was spotless and provided everything that we needed to enjoy our stay. The only area the could use improvement is the landscaping, especially near the river access. The entire trip was a great experience. We truly enjoyed oursel. The vacation home was very nice, with a few exceptions: the downstairs shower didn’t work and the view a little disappointing. But that aside, we would come back . 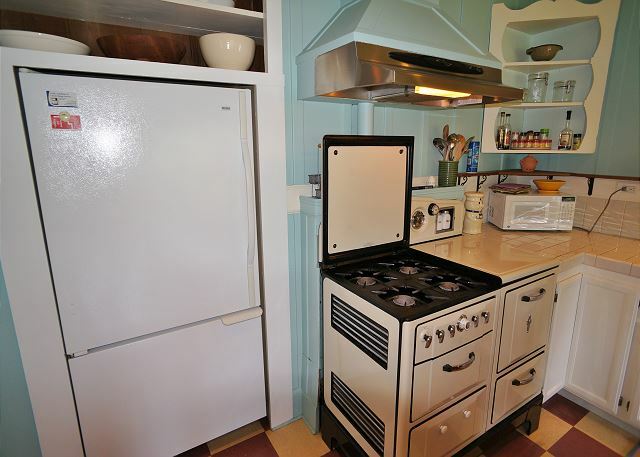 and very well equipped with linens and kitchen items. It was a perfect spot for my family including 2 children to stay! Beautiful cottage with amazing views! 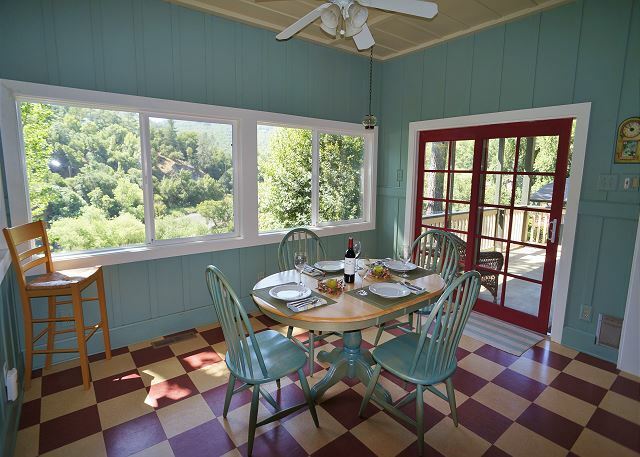 Thank you for choosing the lovely Healdsburg Riverside Cottage for your vacation. We are so happy to see that you enjoyed it. We would love to host you the next time you are in Sonoma County. We traveled to Healdsburg to enjoy wine tasting in Dry Creek and surrounding area. 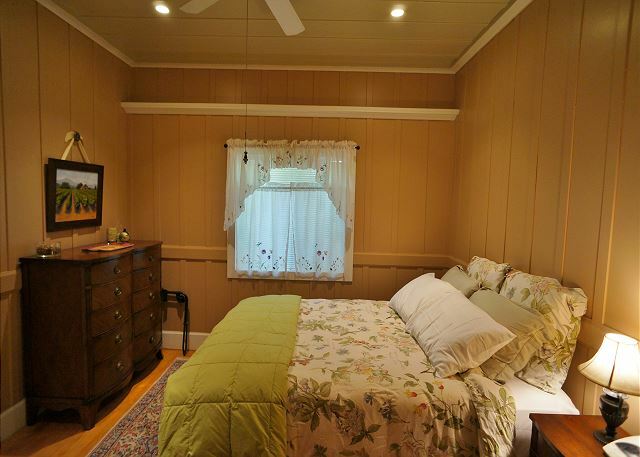 The Riverside Cottage is a comfortable, river view home that more than easily accommodated two couples. This multi-level home has everything needed for a terrific stay, with the river view, outdoor hot tub, and beautiful grounds as 'icing on the cake.' 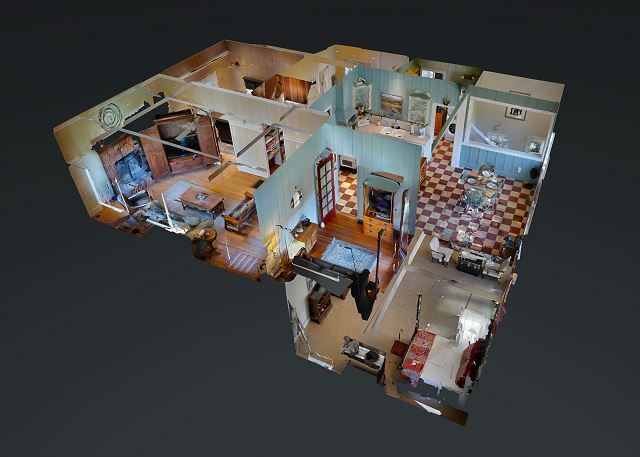 The first floor contains a ;comfortable living room with large fireplace, and a comfortable bedroom with attached bath. 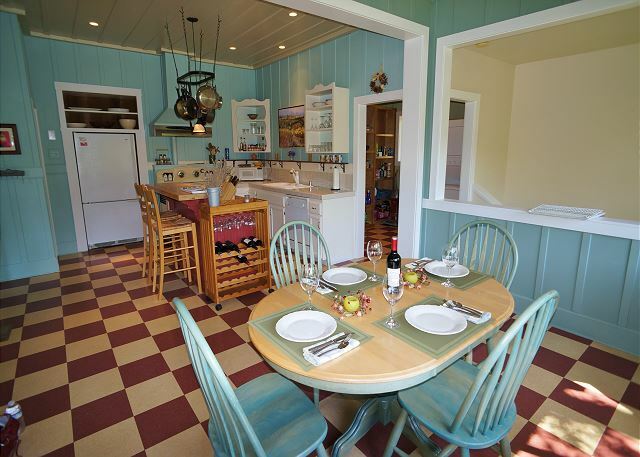 The kitchen is very well equipped and there are river views from the dining area and deck. A den with pull out bed and tv would have provided space for additional guests had we needed it. 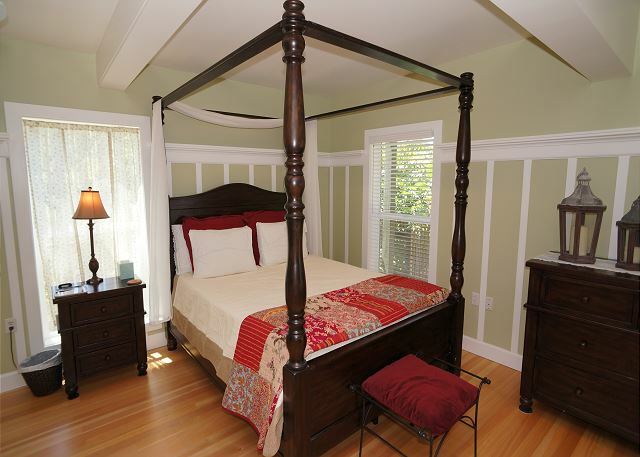 Downstairs you will find a massive room with four-poster bed, day bed, tv, and bath with tub and shower. The home is handsomely decorated and plenty of towels and bath products were provided. From this room you can easily access the hot tub and gardens. While we enjoyed tasting the special wines of Dry Creek, we especially appreciated having this special home to return to each night. The reservation service was responsive and easy to contact and work with. We all enjoyed our visit, would love to return, and without question recommend this property. Nice weekend rental right on the river....needed some minor maintenance like outdoor light bulb replacement for better path and stairway visibility at night. Beautiful views of the river. House adequately provisioned but not enough closet space. comfortable, relaxing home with a beautiful view.